Do you want to download for an individual or a team? Download the Continuous Integration (CI) stream of MyEclipse to get access to regular feature updates and the latest fixes for MyEclipse. All downloads include a free 30 day trial to learn what MyEclipse can do for you! Check the CI Delivery Log for the latest in MyEclipse, and the Stable Delivery Log for the updates on the production-grade stream. Note: Starting with MyEclipse 2015, a single MyEclipse download includes the Standard, Pro, Blue, Bling and Spring products unified together, activated by license. Not sure if you want the Stable (GA) release or the Continuous Integration stream? The stable release has less frequent updates while the CI stream has new features that while very functional, are continuing to be tweaked. Both are great for regular development. 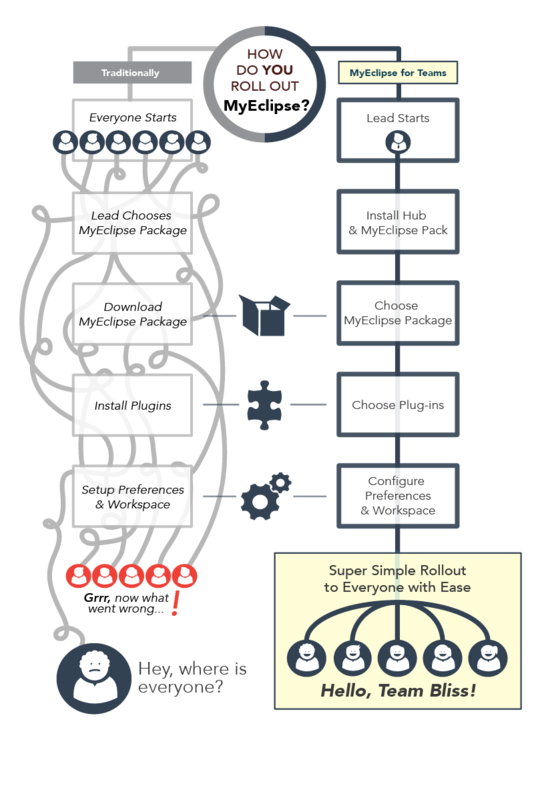 Is MyEclipse tailored for teams right for you? or you want to easily control when team members upgrade MyEclipse. avoiding heavy downloads from the internet and providing enhaced security. If you answered No to either of these questions, we recommend downloading the Individual Edition. *The team hub uses minimal CPU and memory while facilitating team development and can be installed onto a desktop or laptop that is used for other activities including regular development. Delivery Hub for size: / md5: Downloads available for Windows, Linux, or OS X.
Download your MyEclipse Delivery Hub to easily configure your MyEclipse installation with your favorite plugins and settings to then share it with your team. Your Delivery Hub can run on any desktop, laptop or data center box, but is recommended to be one that is generally available on your network to allow simple updating to your team.